Before I got out of bed this morning, I turned on my Blackberry to check the weather forecast. 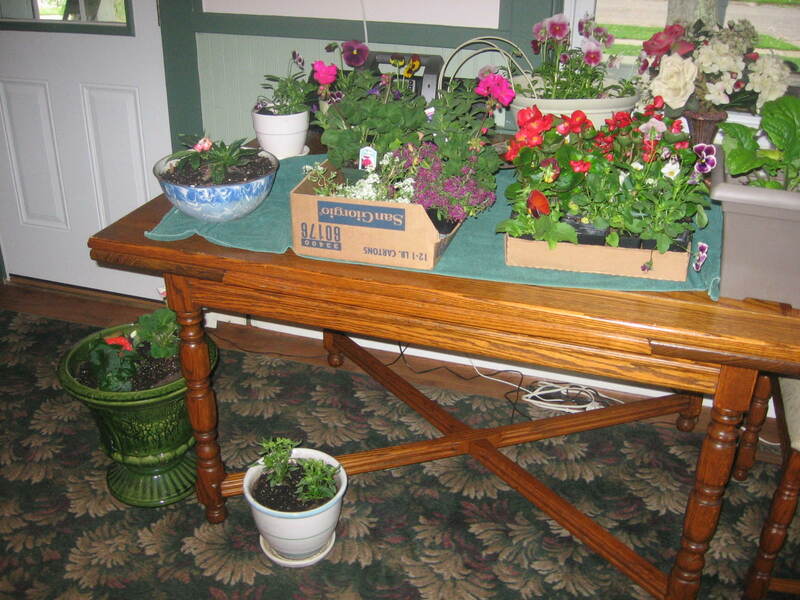 Downstairs, my dining room table was full – again – of flowers that needed to be repotted, but it’s been so dang cold out I haven’t been able to get the job done. They’re blooming and outgrowing their plastic starter pots, but if I wait until ideal conditions to repot them, their roots will have nowhere to go and they will start to die. The temperature was 40 and the forecasted high was 46. Looking ahead at the 10-day, there were no more 30-degree nights predicted, so I knew today was the day, even if it was cold, dreary and miserable outside. I would take them to the garage to repot them and let them live there, protected, for another day or two. I thought about the gardens I planted the year I started losing weight. I started the beds in April 2005 after I’d lost about 35-40 pounds. I built three beds and added soil, manure and mulch to two existing beds. While I was still obese, weighing about 265, I had a lot of energy. Energy born not just from weight lost, but from that euphoric state of no longer living in denial. Just as overeating drained me physically, denial drained me emotionally. Once I lived in truth, I had a clear path for walking (not sprinting) down the scale, and I felt like I could do anything. 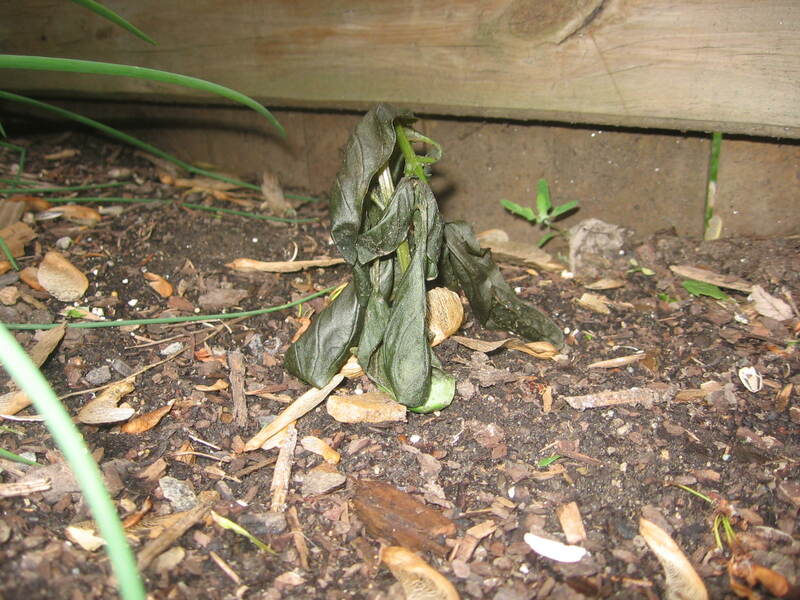 I knew I shouldn’t have put it in the ground last week. I knew there was a still potential for below-freezing temps. But no, I wanted basil in my garden NOW. Well, guess what? It was 27 degrees the other night. While I’ve not fully learned this lesson in terms of gardening, I finally did this last time down the scale: anything worth doing and doing well takes patience. There will always be some resistance and there will always be something you must rise above or allow to just be. If you know this from the get go, the path will be easier to tread. There will be frost in May and there will be food at parties. Just as seasoned gardeners know to respect the weather, people with a plan, a goal and dogged determination have the tools to navigate a dessert table. I can navigate a dessert table. I need a little work in tempering my spring fever. 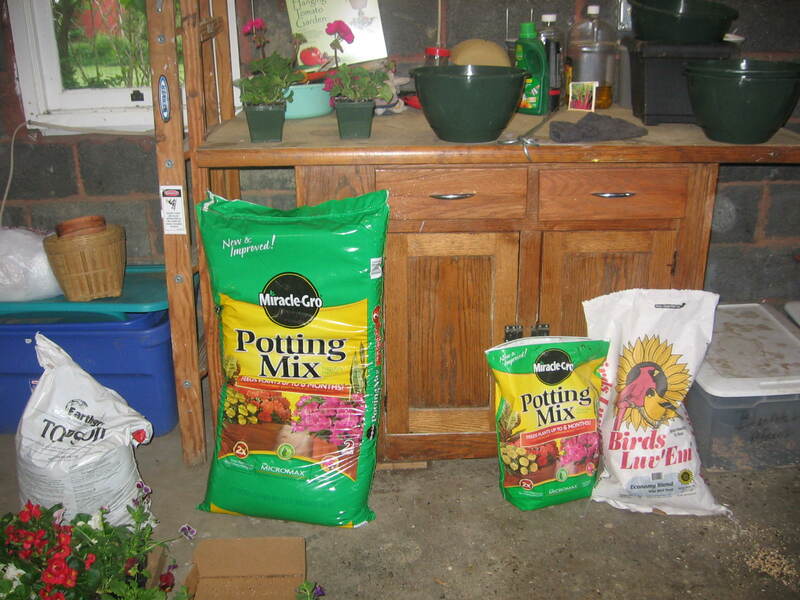 My garage, where my newly potted plants will stay until it’s an itsy bit warmer. Speaking of tools…I’ll be drawing the names of two winners tomorrow for the two books I’m giving away: “Stress Eater Diet” and “Wake Up To Your Weight Loss.” Leave a comment here or send an email to lynnbering@verizon.net before Wednesday at 6 p.m. eastern time and I’ll put your name in the hat! This entry was posted in Uncategorized on May 11, 2010 by Lynn Haraldson. I would love either book! Thanks! There really is no perfect time to do weight loss. I hear so much (and was guilty of at one time) of “I need to wait until after my birthday, or after the holidays, or after all the summer BBQs”. Well, those things happen whether you are trying to lose/maintain or not. It takes patience to work through those holidays and not try to squeeze a big bunch of weight loss in between at 'ideal' times for dieting. Sorry about the basil plant – it looks pretty crispy. I don't know what I have lost yet, I covered up everything with blankets and plastic bags, but I won't know for sure for a day or 2 if everything really made it through the frost. I've always thought Mondays were the perfect time to start to lose weight. You know, a new beginning, after the gluttony of the weekend. I've been doing that for 30 years. You think I would learn! I'm in Michigan and it's very cold here as well. Now, as for that frost/freeze, I just can't fathom. It was 95 here today – nice and warm! I would love either of the books! Hubby built some awesome beds for us this year. I can't wait for our own veggies! Some great metaphors and images here! I guess life really is all about learning from our mistakes, whether it's planting too soon or having a negative attitude to food. The important thing is that we do learn and use our knowledge to empower us to greatness! Great metaphor. I plant excruciating early for this part of the continent (central Canada), but I know if I do I have to be willing to protect stuff. Stick a pot over that basil plant next time, it will be fine. Planning and preparation goes for gardening AND weight loss. Just plant your plants into a little bigger pots until it warms up and then you can plant them outisde. I love gardening too. I would love the books. I still have that whole “I want it NOW” thing going on with my weight loss. But when I hear the stories of people like you, I have hope that I'll one day figure it out and be able to make the changes I need to make for a lifetime and I'll get where I want to be! It's probably too late for me to get in on the drawing.